All about the new premium Gold 200 and Platinum 200 II floor standing models from the British loudspeaker specialist - Monitor Audio. When your entire music collection might reside on a device you can hold in your hand, is there still a place for serious floor standing loudspeakers? It is true that today, we get performance from small speakers that would not have been credited a few years ago. HiFi systems are shrinking and there is an expectation that you can expect more from less. Yet it is this drive to develop smaller, more efficient and higher technology solutions that enables Monitor Audio to deliver far more in their floor standing models - this is in direct comparison to other designers, their own previous models and the smaller iterations of these new ranges. There are a lot of speaker designers and manufacturers out there. But it’s a combination of of attributes that make Monitor Audio unique. They design and build their own speakers from the ground up - all drivers are their own and feature composite metal cones and ribbons that you’ll find in no other speaker. While they started small in Britain, Monitor Audio have grown at a rapid rate and now have resources and and R&D team the few can match. The pace of evolution of their models and ranges is remarkable - every innovation feeds into the range as a whole. Within a short span of time they have launched 4 major new ranges - sliver then the Bronze series in early 2015, the Gold in late 2015 and now the Platinum II. Within each range there are similarities to previous models in size and configuration - but there are obvious improvements to drivers, construction, finish and most importantly, performance. Technologies from the premium ranges have conspicuously filtered down, closing the gap between new and old. Monitor Audio are, in effect, in competition with themselves first. And it is the other brands that are being left behind. 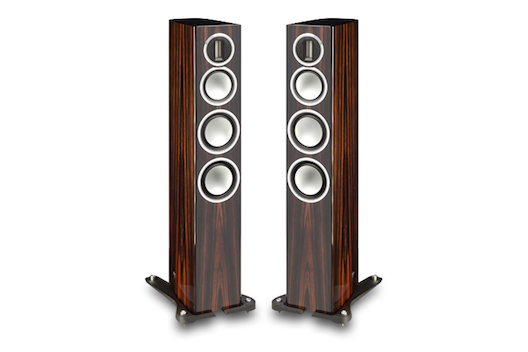 So what will a really good floor standing speaker system do for you? The simple answer is that it will deliver your much more music - both in quantity and quality. It’s an easy assumption that you’ll get more bass - the greater cabinet capacity, larger and more numerous drivers make this so. But you’ll also gain in quality. The Monitor Audio models are all full 3 way designs, with 2 bass drivers, a dedicated midrange and ribbon tweeter for the highest frequencies - so the load is shared rather than having a single driver trying to do almost everything. There is a marked improvement in clarity, especially in the vocal ranges. Efficiency is improved - so regardless of amplifier power you’ll get more music out of a larger speaker. Likewise with more drivers to spread the load across, power handling capacity is enhanced. Unless placed on a shelf, any small speaker needs to be on a stand - the quality of which has a direct influence on the performance. So it’s not that hard to spend as much on a pair of small speakers and stands as a comparable floor standing model. The actual floor space taken up is essentially the same and positioning is likely to be the same in any given room. The one caveat with any larger speaker is that in order to maintain comparable sound quality, cabinet resonance must be addressed - nothing is worse than a boxy sounding speaker and there are far to many cheap floor standing models that are exactly this. Planks. The new Monitor Audio Gold and Platinum speakers are as far from this description as it is possible to be. As pieces of furniture that reside in your room, they are elegant, flawless in finish and very easy to live with. Let’s look first at the more affordable of the two ranges, the Gold and within that, the most compact of the floor standers, the Gold 200. The Gold 200 is very similar to its popular predecessor the GX200 - in the face of it there are subtle improvements in finish, new bass and midrange drivers with a similar dimpled cone to the new Silver series. The cover is a softer fabric than the original perforated metal grille. Specification is effectively unchanged. Having sold a good number of the GX200s we were immediately struck by how much better the new Gold 200 sounds - even straight out of the box they are silky smooth and there is greatly enhanced clarity at both extremes. Dynamics are better and it appears the new model is easier to drive, with even small amplifiers such as the NuPrime IDA-8 able to deliver a room filling sound without strain. Give the Gold 200s some serious power and they absolutely rip along - no signs at all of compression and a bass that defies the slim profile. Simply put, I know of no other speaker at this level that approaches the same level of performance and quality. The Gold 200s are very much a sum of the parts - the comprehensively braced cabinet with advanced porting, the stabilising base, a high precision cross over, an array of new composite metal cone drivers. But for me, the defining component is the ribbon tweeter. The ribbon serves as both voice coil and radiating diaphragm, with every part of the ribbon driven directly and simultaneously without energy storage. Having a mass of just 18mg, its diaphragm is able to start and stop in an instant, producing a transient response capable of defining the leading edge and natural harmonic resonance of complex musical sounds. By comparison a conventional tweeter dome and voice coil assembly is much heavier, so is slower, stores more energy and struggles to deal with frequencies above 20 Khz. Which is real problem when the wider bandwidth of new formats. Even a basic system is quite capable of reproducing frequencies up at 60kHz. Specified to reach ultra-high frequencies straight up to 60 kHz, MA’s Gold series ribbon tweeter will reproduce with ease every last nuance and detail from digital and analogue. What this translates to is immediately apparent when you listen - these speakers really sing and reproduce high frequencies in a way that leaves most other designs sounding flat footed. The ribbon also has unique characteristics in terms of dispersion of sound - there is a remarkable precision of sound staging and the ability to project far beyond the confines of the cabinet. Monitor Audio have greatly improved the continuity of sound between the drivers in this 3 way system. By having a mirage unit, the cross-over point for the ribbon can be moved up further which enables it to be under less demand than the smaller two way models. But more importantly, the consist use of composite metal cones and ribbon for all 4 drivers (two bass drivers remember) means a completely coherent tonality from one frequency extreme to the other. You may have an impression that metal cone drivers might sound ‘metallic’ - in the past you would have been right. 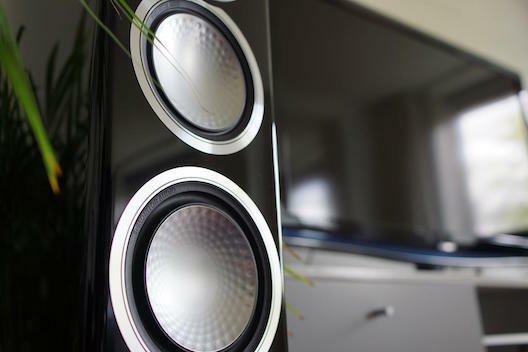 But the Monitor Audio drivers are rather more sophisticated - the metal cones are very thin aluminium but with composite coatings which enhance both rigidity and damping so you get the best of all worlds - high efficiency, high power handling and high resolution. The Gold 200 is the most elegant floor stander in the entire Monitor Audio range - slim with no exposed fixings, a curved, tapered cabinet and integrated floor stand that will slot into just about any room. Only when lifting to you suddenly gain an appreciation of of how solidly built the Gold 200s are. The sound of Monitor Audio has come a long way - originally very ‘British’ in a BBC kind of way, the latest generations deal with a far greater spectrum of music tastes - there is the detail and fidelity that will appeal to serious listeners, but also punch and immediacy that makes them fun and exciting. They can go wickedly loud if required with even comparatively small amplifiers but are in no risk of topping out when attached high horsepower. If there were an ideal all rounder I think the new Gold 200 may be just it - for most people this will be all the speaker you could want. I’ve heard plenty of far more costly speakers that fall well short, and regardless of provenance, UK, Europe, USA or even New Zealand, the combination of value for money, performance and finish is near on impossible to beat. Not surprisingly a good part of the value side of the equation has been re-written in a Chinese factory. There is a consistency of quality that can only come out of a completely modern and clean plant and it’s the combination of Monitor Audios UK design team and up to the minute technical skills in China that make this so. I’m also going to do a little plug for the make up of the MA team in the UK - they are younger and more balanced in gender than most within the hifi world. Every model is very much team effort with the expertise of specialist engineers and designers combined. Serious hifi design is well past the point that a single person can claim to have all the answers. Monitor Audio Gold 200 speaker system NZ$6000 the pair. So how can we do better than the Gold 200s? If you’ve got a larger room, the next model up, the Gold 300 only costs a little more and gives you worthwhile increases in bass extension, efficiency and power handling.The relative affordability of both models allows you plenty of room to improve other parts of the system. The fact that the high frequency response is well beyond almost all other speakers means we’re only starting to explore their capabilities with high resolution formats and electronics that can deliver this kind of response. Likewise the highly sensitive nature of both the Gold 200 and 300s means you'll really hear any improvements made with cables. Although the Golds have rather handsome bi-wire terminals, I’m finding that a better quality single wire connection seems to outperform a bi-wire solution at any given price. Absolutely consider bi-wiring as an option once everything else is sorted in a system but it’s icing on the proverbial cake - not something I’d launch into at the outset. For most people, the idea of the Monitor Audio Gold 200s (or 300s) and some nice new electronics will be as good as it gets. I don’t think we are anywhere near the point of being able to consider these speakers to be a limiting factor in the performance we can deliver. But if you have the resources and expertise, it is possible do even better - so let’s now consider Monitor Audios penultimate range - the new Platinum II series and most specifically, the floor standing PL 200-II.